A £2 million research programme aimed at reversing the damage caused by Multiple Sclerosis (MS) has commenced at Queen’s. 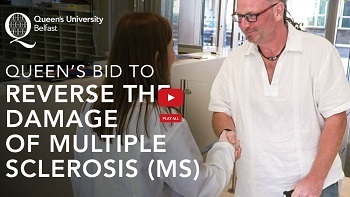 MS attacks the insulating covers of nerve cells in the brain and spinal cord. This damage disrupts the ability of parts of the nervous system to communicate, resulting in a range of symptoms such as vision loss, weakness and paralysis, pain, fatigue, bowel and bladder issues and cognitive impairment. Queen’s researchers hope to find out how myelin, the insulating layer that surrounds those nerves can be repaired. The research initiative is funded by the Wellcome Trust and the Biotechnology and Biological Sciences Research Council (BBSRC). Funding is made up of a prestigious Investigator Award of £1,673,610 from the Wellcome Trust and a grant of £467,333 from BBSRC. It the biggest MS research study currently underway here and the first Wellcome Trust Investigator Award in Northern Ireland. Speaking about the research, Dr Denise Fitzgerald from the Centre for Experimental Medicine at Queen’s, said: “Through these very generous grants we are now able to pursue the holy grail of reversing the damage caused by MS. At the moment the treatments for patients limit the recurrence of relapses but none currently reverse the damage already done. Patricia Gordon, Director of the MS Society Northern Ireland, said: “This is a hugely important and exciting project which illustrates the ambition of those involved in MS research. Research into myelin repair will be welcome news to the 100,000 people across the UK living with MS. We are very pleased to see work in Northern Ireland recognised with such a significant grant and look forward to seeing the results of Queen’s University and Dr Fitzgerald’s important work. Click on the image below to hear Dr Fitzgerald chat with Ian, who has MS. Anyone interested in supporting MS research at Queen’s should contact the University’s Medical Fundraising team on 028 9097 3159 or email n.moroney@qub.ac.uk.